Sorry Jeff Opdyke, I didn't like your book. I hesitated on whether to review it here at all since I don't recommend it, but figured I would write this up to hopefully save some readers from wasting a few hours and subjecting themselves to some pretty poor advice. It's been on my 'to-read' list for a few years and I finally picked it up from the library since I've been looking for more ideas on things to teach kids about money. 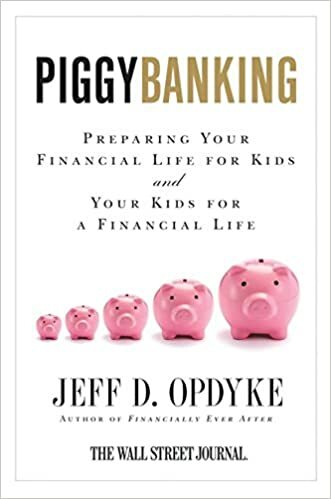 Overall, I felt that the book was well written and that the author's intentions were good, but following the teachings in this book will really help readers and their children achieve financial mediocrity. Sure, I guess financial mediocrity is better than being destitute and impoverished, but I'd like to aim higher. This book spends an inordinate amount of time focusing on teaching kids how to build credit, borrow money, and pay interest. Little, if any, talk is given to teach your kids how to save up and pay cash for big purchases, avoid paying interest, and develop other habits of wealthy individuals. In fact, he even proposes loaning your children money at high interest rates with the idea that it will teach them to not borrow. It is my belief that what this actually teaches kids is that there is no need to wait to get what they want. Even at high interest rates, they still have the thing now. All of this was largely excusable, but what turned this from "this book is ok, even though I won't really follow the advice" to "are you kidding me, what is this guy thinking?" was when he recommended buying a whole life insurance policy for your kids as a way to build up cash value. This is wrong on sooooo many levels. Anyone who spends 10 minutes comparing whole life insurance to other investments will tell you what a terrible investment it is (some examples are here, here, and here). That is, anyone besides the people who sell it. Buying whole life insurance is a bad idea for you or for your kids and I'm proud to say that in 10 years of holding a life insurance license, I never once sold a whole life policy. You will be much better off if you remember that Investments are not insurance, and insurance is not an investment. Mixing the two will result in below average performance. If I wasn't clear, I don't recommend this book. I have a few others on this same topic that I should get to soon and hopefully they are better.